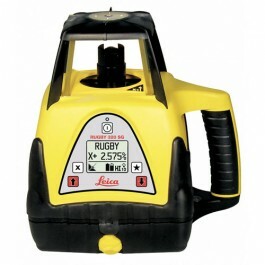 The Rugby Grade laser is designed to serve your needs in a wide variety of applications. It is a proven tool for increased production with substantial reduction of labor, time and material costs. It can be used to accurately control land leveling, sloped or level grading, trenching, open cut mining, dredging, contouring of levees, general construction and excavation. The Rugby Grade lasers are rugged, accurate and fully electronic with an operating range up to 3000 feet (900 meters) diameter. The Rugby 320 SG is a single grade laser and is capable of producing an accurate plane of laser light for applications that are level (1) or having a single grade (2). Alignment is as easy as sighting over the top of the Rugby to your control point using the integrated alignment sights or the optional sighting scope assembly. For increased accuracy, follow the procedure for “3.5 Precise Alignment of the Axes”.